Wednesday, November 21st dinner meeting. Our keynote speaker is Yvette Plante, Canadian Red Cross Program Representative BC & Yukon Respect Education Program. Learn how to promote respect and prevent bullying and violence in our communities and schools. Come and connect with our great group of heart-centered women from all walks of life for a great dinner and networking with a difference. We’re so much more than just a networking group. We’re part of an international business & professional women’s group. We take action, advocate and make a difference for women in our communities! Everyone welcome! Reserve now. This evening is already filling up fast, so to avoid disappointment, book your spot now! Send an email to reservations@bpwlangley.com with your name and that you will be paying at the door (cash, cheque or credit card – sorry, no debit cards accepted), or you may also book through Eventbrite: Sign up HERE. More about our speaker, Yvette Plante. Yvette works for the Canadian Red Cross in the Respect Education program. The program has aimed to prevent violence and abuse through the promotion of healthier relationships for more than 25 years. Yvette has been working for the Respect Education program for four years, and also has over 15 years of experience working as both an Analytical Manager with the RCMP, and a high school Social Studies teacher. She is passionate about working with children and youth to create stronger communities and inspire future leaders. 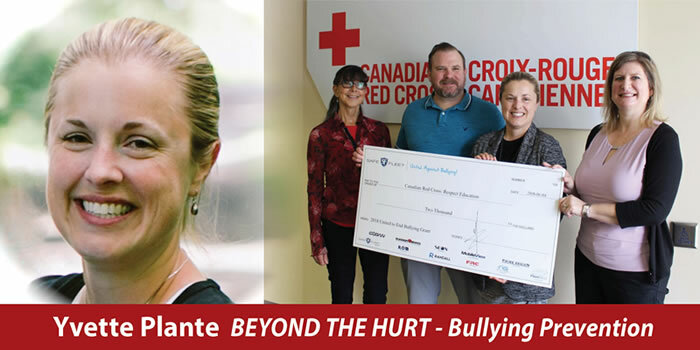 Beyond the Hurt (BTH) is a peer-led program which trains high school students as Youth Facilitators (YFs) who deliver bullying, harassment, and discrimination prevention education workshops to their younger peers. This program focuses on establishing safe and inclusive peer relationships and equipping youth with the skills and information to take on a leadership and advocacy role in their schools and communities. Our Respect Education trainers typically train between 10-20 students over 2 days through a variety of lessons, discussions, and activities. BPW is a non-sectarian, non-profit, and non-partisan organization that works to improve the economic, political, social and employment conditions of women in Canada. BPW International is an influential international network of business and professional women from over 100 countries in 5 continents with Consultative Status at ECOSOC/United Nations. Founded in 1930, BPW International develops the professional, leadership and business potential of women on all levels through our mentoring, networking, skill building and economic empowerment programs and projects around the world.